March 31st, 2019, marked the 55th anniversary of the military coup in Brazil which called for two decades of military rule there. 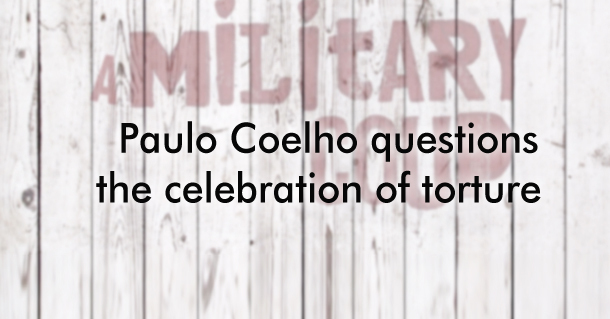 Jair Bolsonao, the president of Brazil and Paulo Coelho the novelist got the world talking on the events that had longlasting impacts on the people for different reasons. Jair Bolsonao ordered the country’s armed forces to observe the 55th anniversary of the 1964 coup which bought the military to power. The military regime which lasted for 21 years marks a dark phase in Brazilian history. Bolsonao, a far-right congressman and former military officer who rose to power in 2018 which could be stamped as the politics of forgetting Brazil has been nurturing after the years of dictatorship. In response to this post-dictatorship wave that has been running through the country, the author Paulo Coelho wrote an op-ed for the Washington Post recounting the detention and torture he suffered during the military regime in Brazil. The aphotic period of repression took a toll on the physical and mental health of the citizens, curtailing their basic rights and eliminating democracy for twenty-one years. It was a period of severe censorship, where musicians and its oppressors were suppressed in hideous ways. Paulo, who was a songwriter then faced the tremors of the tortures when he was arrested for a reason unknown to date. The article is repleted with details rattling the reader causing a revolt to the moral sense. The president’s praise for the military regime, portraying it as a ‘democratic revolution’, is being widely condemned by the citizens and survivors alike. The article has had an enormous impact in Brazil and turns out to be the most read opinion piece on the Washington Post.